After the Notre Dame game, Rodriguez was asked a lot about the amount of touches Denard had and whether or not he wanted to see the running backs get involved more often and be more productive. His response was that Notre Dame was doing a lot of things that forced the ball into Denard's hands, which, huh? After watching the game over and over again, I found a few plays that the running backs were actually given the ball (it only happened 13 times all game) and saw that this may not have been the case. 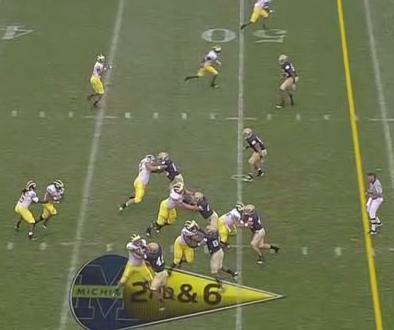 Michigan is in the shotgun with Michael Shaw to Denard's left and Martell Webb set up as an H-back. This is a simple zone-read. 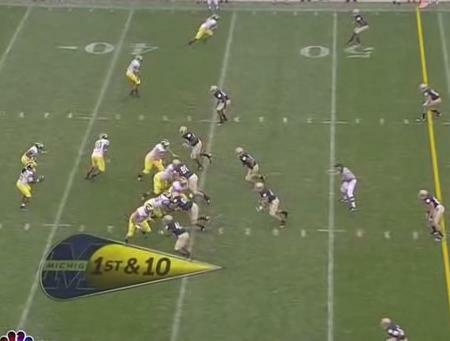 On this play, Michigan will leave the weakside defensive end unblocked for Denard to read. After the snap, you can see that Mark Huyge is headed straight for the weakside defensive tackle and leaving the defensive end unblocked. Martell Webb is charged with blocking the weakside linebacker who was shaded over the slot receiver. 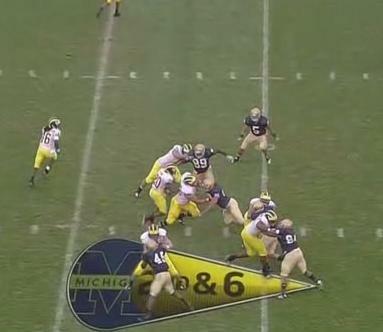 Denard has to read the weakside defensive end. 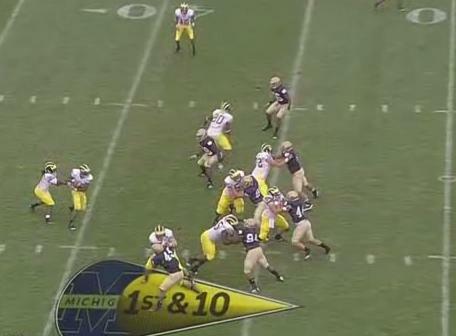 If he crashes down on the handoff to Shaw, Denard is supposed to pull the ball himself. Notre Dame is also blitzing the middle and strongside linebackers in an effort to plug the middle of the offensive line. 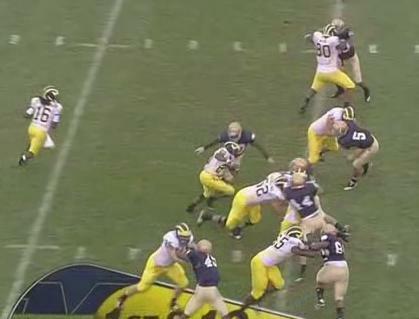 As you can see here, the defensive end is staying high, forcing Denard to hand the ball off. 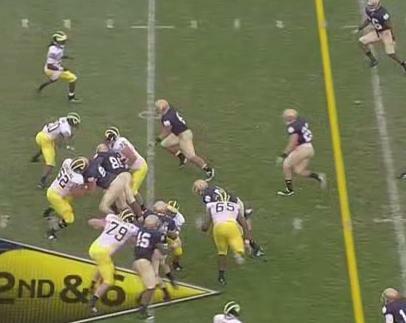 But the Notre Dame linebackers have engaged with the offensive line before they were able to get upfield. 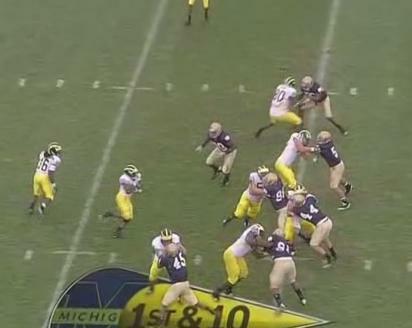 If Michigan's linemen were given a free release to the second level, they're fast and smart enough to make the block. 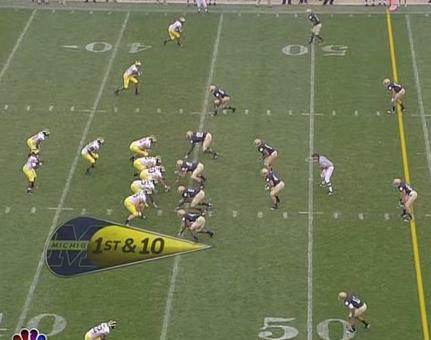 But instead, Notre Dame's linebackers were told to plug the holes at the point of attack and make Shaw slow down at the line and pick a hole. In doing so, it gives the weakside defensive end enough time to crash down for the tackle. Shaw gets wrapped up by the defensive end that's never supposed to tackle him if Denard makes the right read, which, for the record, he did. 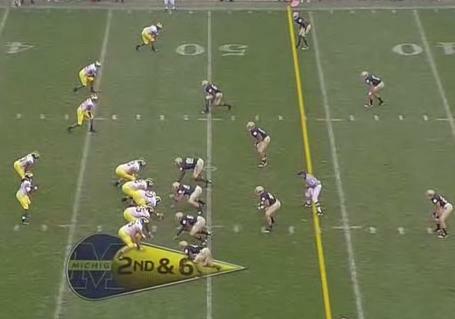 In this instance, Notre Dame effectively neutralized the play by blitzing their middle and strongside linebackers. But if they did this too often, a play action pass could very easily burn the Notre Dame defense as Michigan did earlier in the game. It's a chess game and Notre Dame won this time. Shaw doesn't get off without any blame in this game, though. Here's another basic zone-read. The difference here is that Denard will be reading the middle linebacker (in the middle of the field, just outside the weakside defensive end) rather than the weakside defensive end. Denard, if he pulls the ball, will also have the option to throw a wide receiver screen. On the snap, you can see that the offensive line is blocking one-on-one with the four defensive linemen, and David Molk is releasing to the second level to block the playside linebacker. 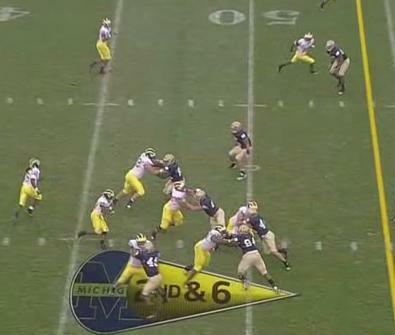 Denard is reading the middle linebacker who will once again stay high and force Denard to hand the ball off. All of the offensive line is engaged with their defenders. From here, this is basically a zone run right. Shaw needs to follow the zone that the offensive line is creating and stretch this play toward the sideline. Shaw darts into the zone but rather than stretching the run to the sideline through the hole created between Omameh and Dorrestein, he decides to cut upfield. The hole between Omameh and Dorrestein is even larger now, but Shaw has decided that it would be better if he runs into the defensive help and the vanishing hole in the middle of the offensive line. From here, Shaw tries to spin out of trouble and breaks the back toward the weakside where there are linebackers awaiting his arrival. 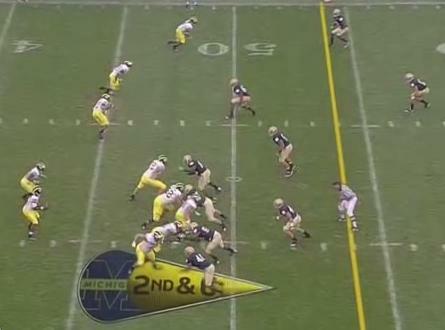 As you can see, what could've been a promising run to the outside ends on the wrong side of the field and for far less yardage than we'd expect given the blocking advantages Michigan had. This is the kind of play that you can turn to when Rodriguez says that each running back shows flashes of brilliance but needs to be more consistent. On both of these plays, Shaw probably had a gap on the right side of the line but instead decided to cut the ball upfield into defensive help. It also shows that Notre Dame looked to get the ball out of Denard's hand on at least a few plays, but through a combination of good defensive play calling and poor running back play, these were neutralized. In the coming weeks, I expect more chances for Shaw and Vincent Smith to get looks like this. They need to make the correct reads and, if they do, defenses will be forced to be more balanced. Very helpful post. I learned alot. Ezeh vs. Kovacs: Who's responsible?